Gold and SIPPs: The feeling of numbness in your hands – despite wearing your thickest gloves – that you have as you scrape the ice off the car on a dark January morning are back again, writes senior bullion dealer at Gold Investments, Oliver Temple. Those festive memories of sitting in front of a roaring log fire, tearing the paper off a present and then reaching for another sweet, now seem to be only a distant memory. The new gloves, however, are a good reminder of Christmas. The chance to spend more time such as painting, walking and going for long exotic holidays can seem very appealing on cold days. Not many of us would have thought about pensions over the holidays but we need to in order to have the lives we want to lead later in life. The Government introduced Self Invested Personal Pension Schemes (SIPPs) a number of years ago. SIPPs gives the flexibility of holding a range of assets in one own’s pension pot. Gold can also be part of a SIPP. The precious metal is attractive to investors because unlike paper currency, coins or other assets, it has throughout the ages maintained value. 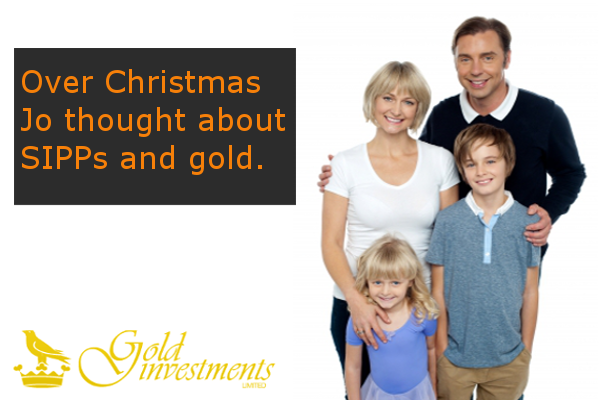 Many investors also see gold as a way to pass on and preserve their wealth from one generation to the next. I run my own recruitment business which at times can be very stressful. We had a lovely time over Christmas with the family and I started thinking more about my own retirement. I can’t imagine running my company in my 90’s, for instance. I am now 42 so need to be thinking ahead more. My partner, Paul, has a small pension from the Civil Service but it would not be able to sustain us. We have now started to look into SIPPs seriously as I do not have my own pension. From what I have read, many investors have gold in their portfolios. I can see it makes sense as I believe historically gold has traditionally done well in turbulent economic times which I think we are entering into. Jo is right to be thinking of including gold in her SIPP. Gold should not form all of a portfolio – it could make up between 10 -15% of an investment portfolio. It can be seem daunting adding physical gold to a SIPP but it does not need to be. See 12 reasons to choose Gold Investments. Image of our offices from Google. The gold bounce: more to come, or sell now?